Rev. Gregory Uhrig, pictured in 1983. He served at St. Anthony's in Easton from 1978 to 1982. Church officials in central New Jersey's Diocese of Metuchen last week removed priest Gregory Uhrig from service over allegations he sexually abused a minor 30 years ago when he worked for the Diocese of Allentown. 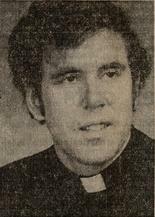 Uhrig served in several area parishes while in the Lehigh Valley diocese, including St. Anthony's Church in Easton from 1978 to 1982, after which he went to St. Ursula's in Fountain Hill, according to Express-Times archives. Uhrig was temporarily transferred to the Diocese of Metuchen in 1983, and was incardinated there sometime in the early to mid-90s, according to Allentown diocese spokesman Matt Kerr. Uhrig, an Elizabeth, N.J., native, was serving St. Luke Parish in North Plainfield at the time of his removal.